The NecksGen REV model takes comfort, fitment and helmet clearance to a new level. With simplicity and ergonomics leading the design flow, the new REV design has no need for a frontal yoke. With no yoke, there is no frontal interference with the helmet and no chance of the device causing any injury to the chest or collar bone. Sizing the REV is fairly simple if you use this handy chart. Remember that fitment is based on personal preference, and sizing isn’t necessarily limited to the measurements shown. If your neck is wider than the inside diameter of the device shown, the device could still fit, and will function properly, but some comfort will be sacrificed. If you are on the edge between a medium and a large but have narrow shoulders, go with the medium. 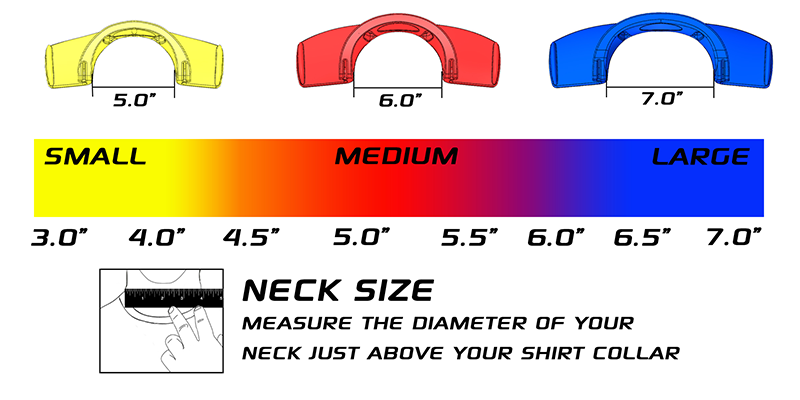 Please refer to NecksGen Sizing Chart and all product images to determine correct size. Refer to the NecksGen Wedge Sizing Chart to determine the correct size. The NecksGen REV model takes comfort, fitment and helmet clearance to a new level. With simplicity and ergonomics leading the design flow, the new REV design has no need for a frontal yoke. With no yoke, there is no frontal interference with the helmet and no chance of the device causing any injury to the chest or collar bone. The backbone of the product is the patent pending Tension Neutralizing Tether (TNT). This proprietary design allows for maximum range of head motion with superior frontal and side impact protection. The low profile design encapsulates the sliding TNT tether and allows for minimal rear interference with the helmet and the device. Weighing in at just over a pound, this low profile design makes egress in and out of the car in an emergency easier. The NecksGen REV unit offers exceptional comfort due the placement of the device on the large trapezoid muscle on the rear of the shoulder with a cutout around the spinal section of the driver. A padded section over the collar bone adds to this comfort and minimizes pressure from the seat belt. NecksGen REV uses the quick release helmet attachment system proprietary on all NecksGen products. Surpassing our expectations in SFI 38.1 testing, NecksGen feels that they have achieved the ultimate goal of making the safest, smallest and most comfortable neck brace available. All NecksGen REV head and neck restraints have passed the mandated SFI 38.1 testing procedures. Due to the innovative features of the designs, the NecksGen head and neck restraints have surpassed our expectations in test results. 1. Quick Release Helmet Hardware: Unique single hand quick eject helmet attachment system. 2. Emergency Pull: Optional pull tag for quick disconnect. 3. Padding: The shoulder and collarbone padding provide added comfort to the unit. 4. Winglets: Large adult units can accept 2” or 3” seat belts. Small unit accepts 2" belts only. The wings aid in keeping your harness in place under impact. Even in multiple impact situations where the belts could loosen. 5. Tension Neutralizing Tether: Using a proprietary single tension-neutralizing tether (TNT), the loads under impact are distributed through four different load paths. This unique system offers an equal distribution of forces under impact. This system also offers a full range of head motion and side and angular impact protection. Sizing the REV is fairly simple if you use this handy chart. Remember that fitment is based on personal preference, and sizing isn’t necessarily limited to the measurements shown. If your neck is wider than the inside diameter of the device shown, the device could still fit, and will function properly, but some comfort will be sacrificed. If you are on the edge between a medium and a large but have narrow shoulders, go with the medium. The NecksGen REV and Original units come with a fixed length tether that is a predetermined length to fit most drivers. Certain circumstances may require you to need a different length tether. Neck length, helmet drill locations, seating angles, shoulder muscle build, posture, and suit thickness may all play contributing factors into how much tether length/slack you will have. After installing your helmet hardware and test fitting your NecksGen in your car, have a friend help you do a slack test to ensure you are within the safe region of tether length for your situation. Slack Test: Get buckled in your car as if you are ready to race and look straight ahead to the horizon. Have a helper lightly pull any slack from the tether all to one side. Pinch the tether to form a loop and measure the total length of the excess tether. This number should be between 2.0 and 4.0 inches of total slack. This is the ideal range. If it is not in this range, contact NecksGen for an appropriate length tether for your situation. Tethers are available in one inch increments. Pit Stop USA offers NecksGen REV Head and Neck Restraints and NecksGen Wedge Helmet Supports at low everyday prices. Be sure to check out all of our products from NecksGen including NecksGen Head and Neck Restraints.